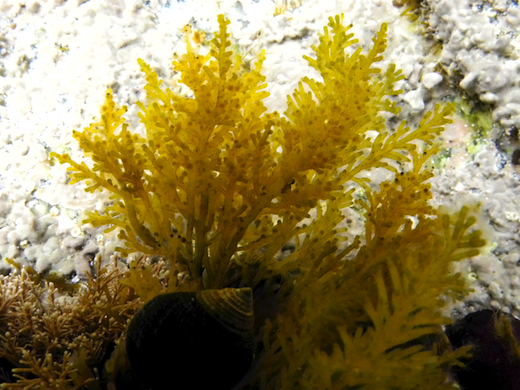 Description: Cylindrical, cartilaginous, tufted, dark purple to greenish yellow fronds, 150 mm long. Main axis with repeatedly pinnate branching, branches mostly alternate, shorter towards apex giving pyramidal outline. Ultimate ramuli short, patent, truncate. 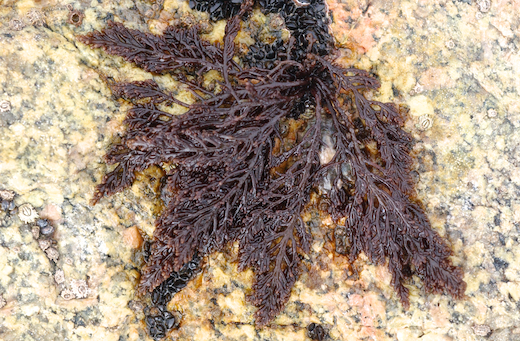 Habitat: On stones and limpets in pools, occasionally on mussels on open rock, rarely epiphytic, often forming a turf in damp crevices, particularly common in upper intertidal, widely distributed, locally abundant. Key characteristics: Terete thallus, discoid holdfast. Similar species: Osmundea truncata, which also has a discoid holdfast but is distinctly compressed in the upper parts, and is generally found growing epiphytically. Site © M.D. Guiry 2000 - 2019. Important copyright notice: all text, design and photographs on this site are copyrighted by M.D. Guiry unless otherwise stated and all rights are strictly reserved. Click here for copyright information and contact. Website design: 249 Design Studio. Site maintained by M.D. Guiry (michael.guiry@nuigalway.ie). There have been 8736670 page loads since 1 January 2014 on 25 April 2019.